ndy was the next machine released from the Williams/Bally pinball skunkworks after Twilight Zone. IJ was the first pin to feature a new sound system known as DCS (Digital Compression System). The DCS was originally planned to debut on Twilight Zone, but the system was still under development when TZ went to production. The DCS is responsible for IJ's incredible sounds due to the amount of storage space available using the new system. ndy was also the first machine to use Williams' new opto-based ball trough. While this design was a great idea, this early revision ball trough is one of the better-known faults with Indy. Williams has since evolved the ball trough and the same basic design is still used today. See the Tech Tips section for more info on this. 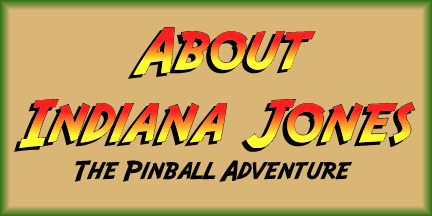 inally, IJ was the first machine to use a player controlled tilting mini playfield. As far as I know, it is still the only game to use such a device. The Path of Adventure mini playfield is another source of frustration for IJ owners and operators. The Tech Tips section contains more info on fixing the PoA.